I know it's late - rather, it's early Friday morning. I've been up following the news out of Egypt. By the most recent count, in a 24-hour period, all across Egypt, 52 Orthodox churches were burned. I've been complaining on Facebook for a month or so that there are accounts of martyrdom and persecution coming out of many countries, but there is no news coverage of it in this country. I have to get my news on Facebook, from people who heard it by twitter from their roommate's friend who's somewhere in the middle east waiting for a flight out of the country. Lately the most reliable sources have been the patriarchal and archdiocesal websites. But, finally, even CNN is covering what happened today. There have been hundreds of new martyrs, like New-Martyr Eugeny Rodionov. He was doing his military service, and was martyred by his own Chechnan troops for refusing to remove his cross and become a Muslim. It was in 1996, and he was martyred on his nineteenth birthday. That got no media coverage here; the story reached the West and the word was spread by Pinterest. Why wasn't this news? If it had happened to anyone but a Christian - and especially, I think, and Orthodox Christian - the story would have hit the airwaves as a hate crime. But Christians are dieing for their faith in many parts of the world, and no one seems to care. Tonight it's Egypt. We spread the word on Facebook and Pinterest. 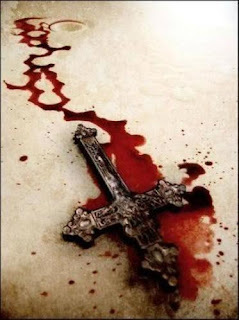 I changed my profile picture in honor of the martyrs and confessors. And we pray. Please pray for all of us. Now I'll try to sleep.